Why can’t you find these in the US?! I wrote about kitchen dish drying cabinets back in September 2006 and it has been a popular search item on this blog over the years. We have always found these to be very practical and had them in both of our apartments in Ascoli Piceno. Our house here in Trivigno does not have cabinets as our plans for the kitchen we eventually want is a work in progress. When we arrived we installed a functional kitchen to use the space we have within our budget. With our limited counter space we were longing for somewhere to dry dishes and IKEA came to the rescue. 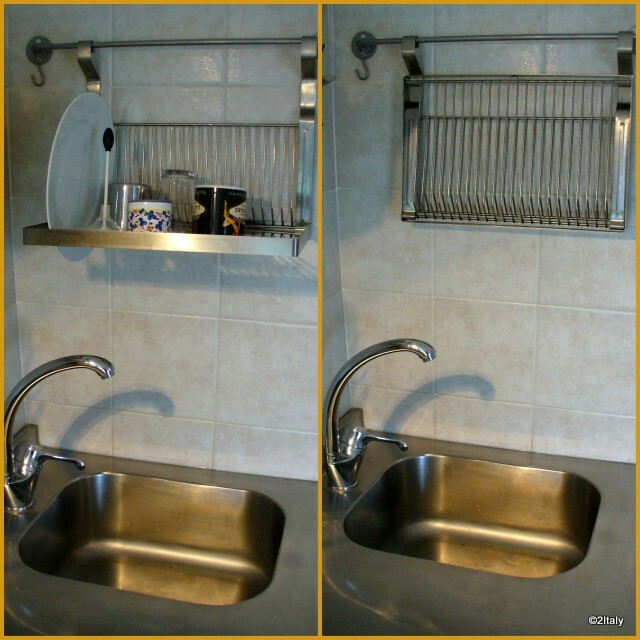 We found a rack that hangs on the wall that I have placed above the sink. The best part is that it folds up and is out of the way when not in use. When we lived in Northern Virginia we never saw anything like this in the IKEA stores in that area. Why?! We try to make most of our purchases at smaller local stores in and around Potenza but sometimes it can be difficult to locate what we need. I’m not a big-box store fan but I must admit that here IKEA has always been a good source for useful products at reasonable prices. However, IKEA for us means about an hour and a half drive to one of their newest stores in Salerno. Another incentive to buy local! I believe that Italy has the greatest ideas for compact useful kitchens. I have a cousin who could produce the most fantastic meals on a little 4 burner square stove that was positioned near a counter...the whole thing the size of a closet in the States. I have another cousin in Gela (Sicily) who was so excited to show us her new "American" kitchen, with sprawling counter tops and a microwave oven. I think those dish racks are the most sensible item! I love these dishracks!! They are so totally convenient. Our problem here is that all we have above our sink and the wall it is on, is windows. Otherwise, I would find a way to have one here. We LOVE IKEA. The best thing about it in Italy is that you can just go pick up whatever you need as opposed to waiting six weeks for it to be delivered. Is it because so many folks in North America use dishwashers? Patricia - We are amazed at what people here can produce from little kitchen spaces. Jane - True that most US kitchens have a window above the sink, that would make the dish rack an issue. Louise - IKEA is a handy place. Ytaba36 - For a few dishes a dish racks so much more practical. I agree - you also can not buy them in England - we had to have one made recently! !